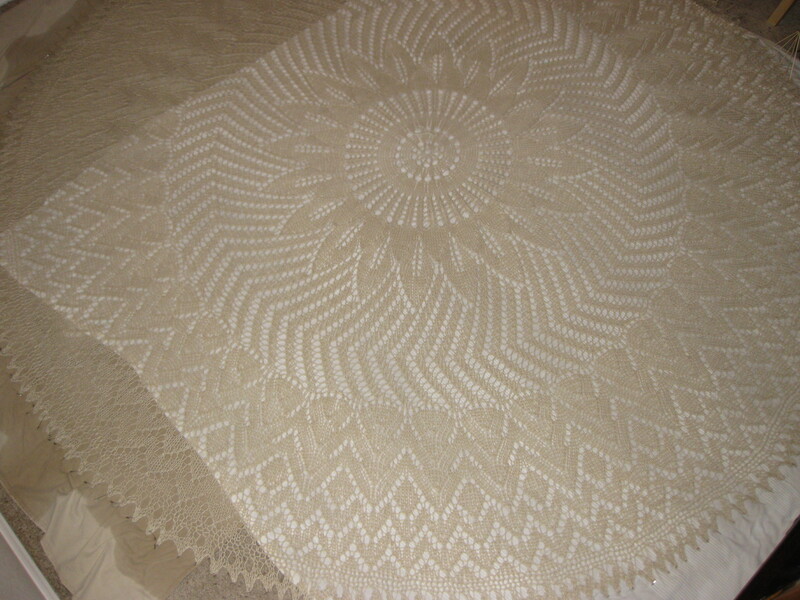 I snapped this picture while I was blocking the new samples of Baby Sophisticate to show my technique for getting a nicely rounded shawl collar. 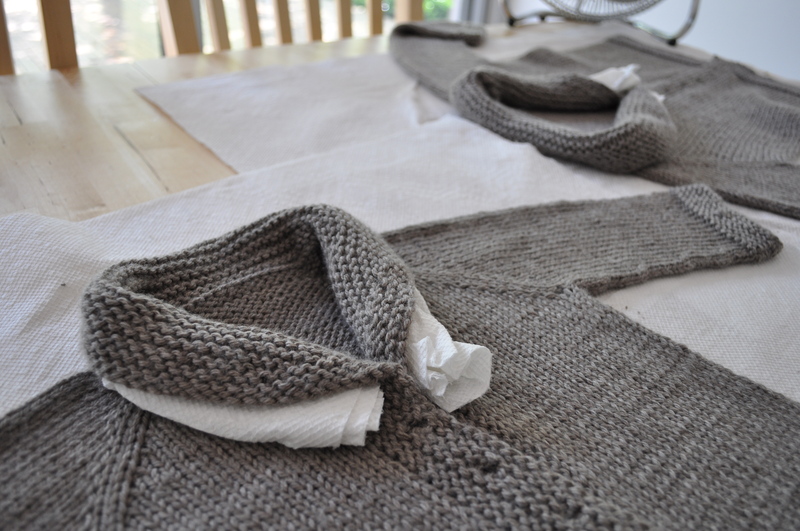 While wet blocking the sweaters, I simply rolled up a paper towel and folded the collar over it so that it dried in the shape I would want when the sweater is being worn. 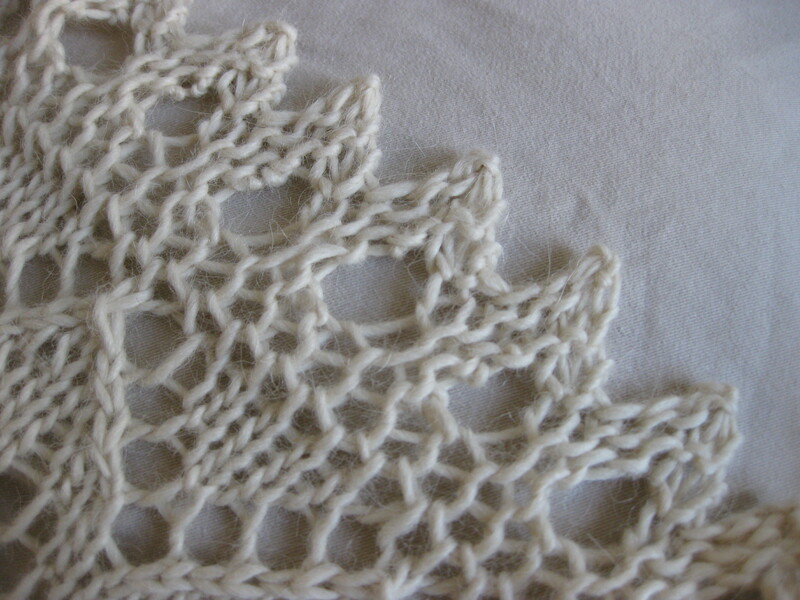 This helps to avoid the really stretched out and flat collar that can sometimes happen with wet blocking. 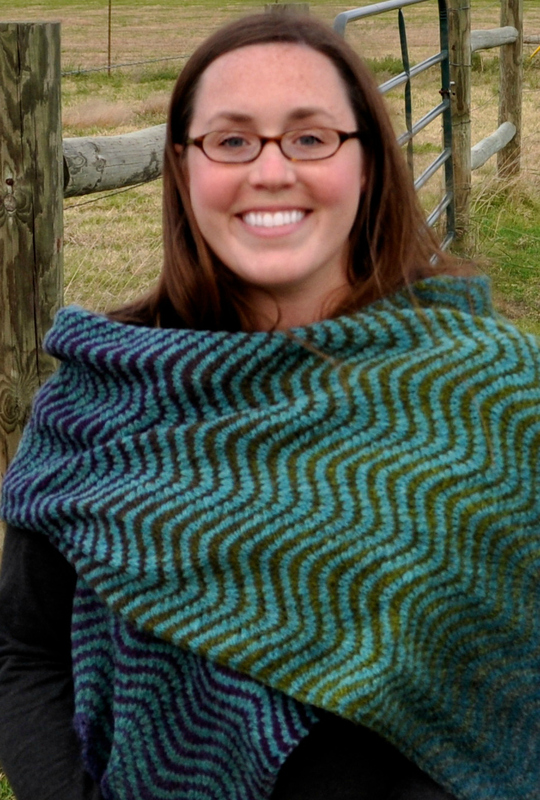 A few months ago I was browsing on Ravelry and spotted the most amazing shawl; a beautiful combination of colorwork (in stripes!) and a graceful asymmetric crescent. I knew I had found a real gem and seconds later I looked at the project count and realized I was a little bit late to the party and that pretty much everyone else had also discovered this gem. 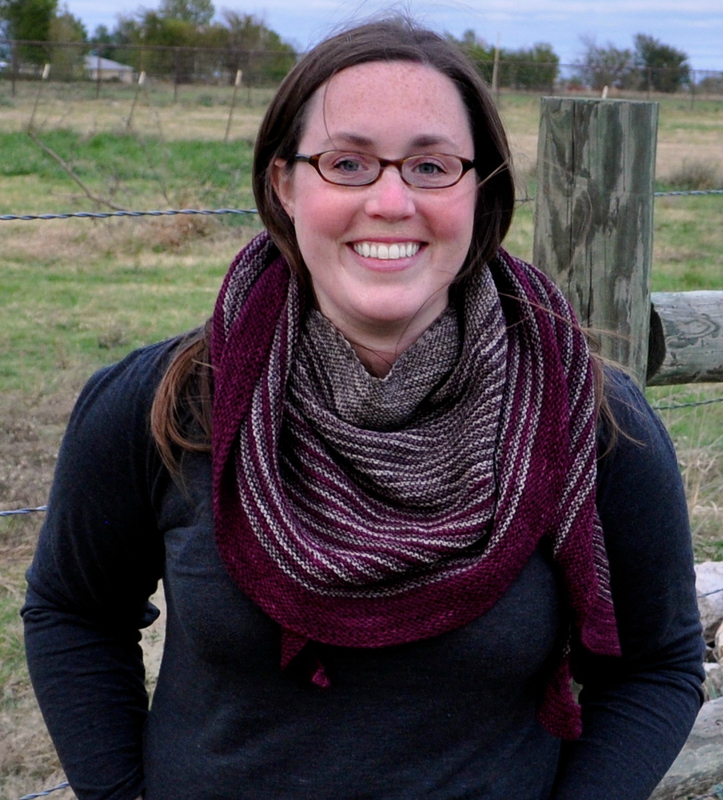 It’s the most recent (in my memory) in the everyone-must-knit-this genre and I totally get it – this pattern is awesome! It’s the amazing Color Affection by Veera Välimäki. 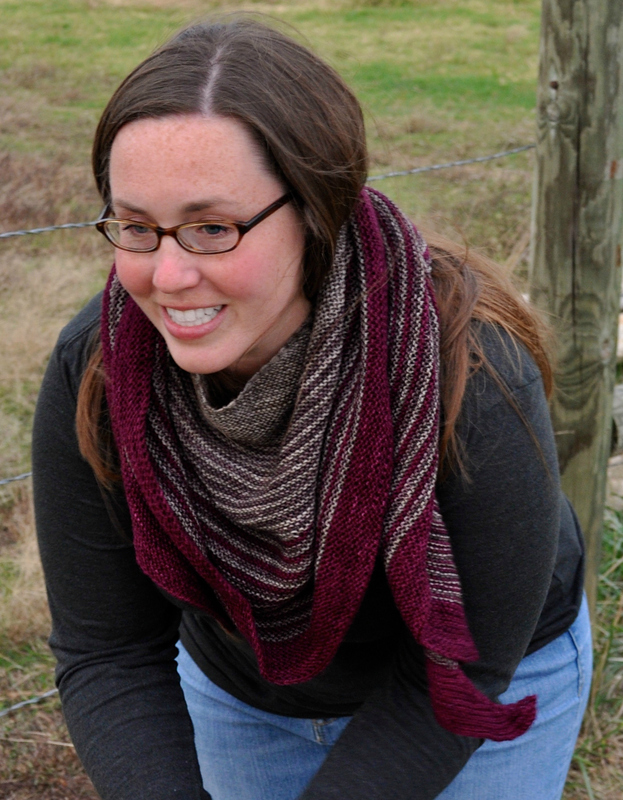 Color Affection is a lovely pattern, but I’m not going to lie to you and say those final rows don’t get long! 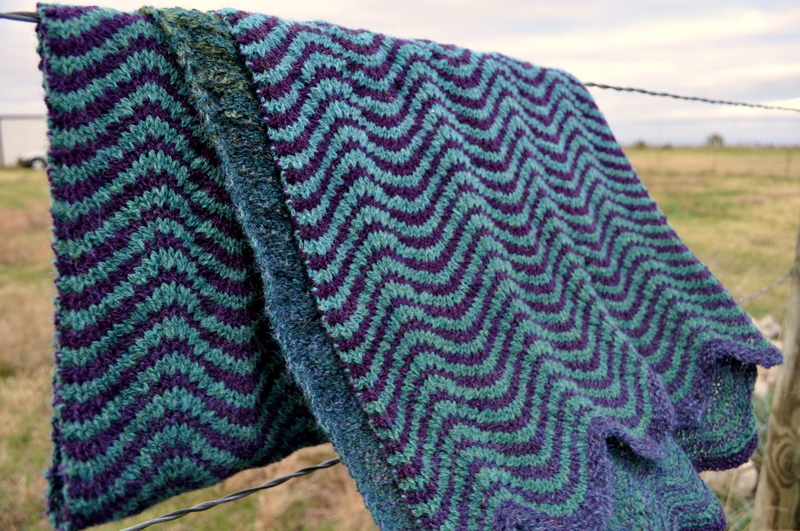 However – I’m typically in heaven if I’ve got a sea of garter stitch ahead of me and if you throw in something like color changes to sweeten the deal, it’s perfect. Keeping track of the increases got a little bit tedious, but wasn’t too hard to pay attention to. I did decide (as suggested by many knitters before me) to add a yarn over between the first two stitches that I then dropped on the return row so that the edge wouldn’t get too tight. I’m absolutely in love with the finished product and I’ve been wearing it everywhere! There’s actually a lot more fabric to this shawl than my usual go-to’s (these two), so I find it really easy to wear (I’m not worried about it slipping out of place) and super cozy. And did I mention the stripes? I’m such a sucker for stripes! And Madelinetosh . . .
My first time working with Kauni! Sasha’s mom and I stopped in at a few yarn shops over last Christmas (I know, I know, I need to get these finished objects blogged about in a more timely manner!) 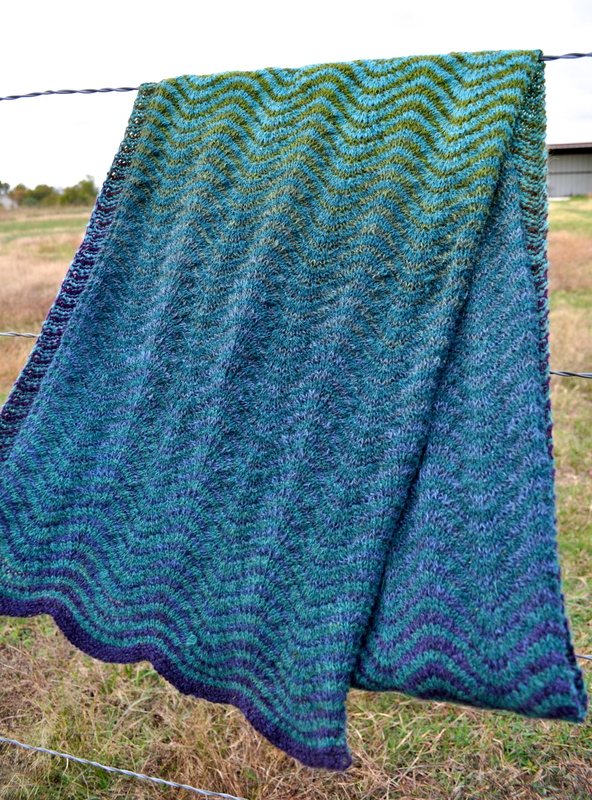 and happened to see one of the shop’s employees knitting a large shawl with two colors of Kauni striped together in a feather and fan pattern called the Wiggle Wrap by Sally Brandl. I’ve been wanting to work with Kauni for a while, and I have always loved striping Noro, so I thought this would be a good pattern to start with. 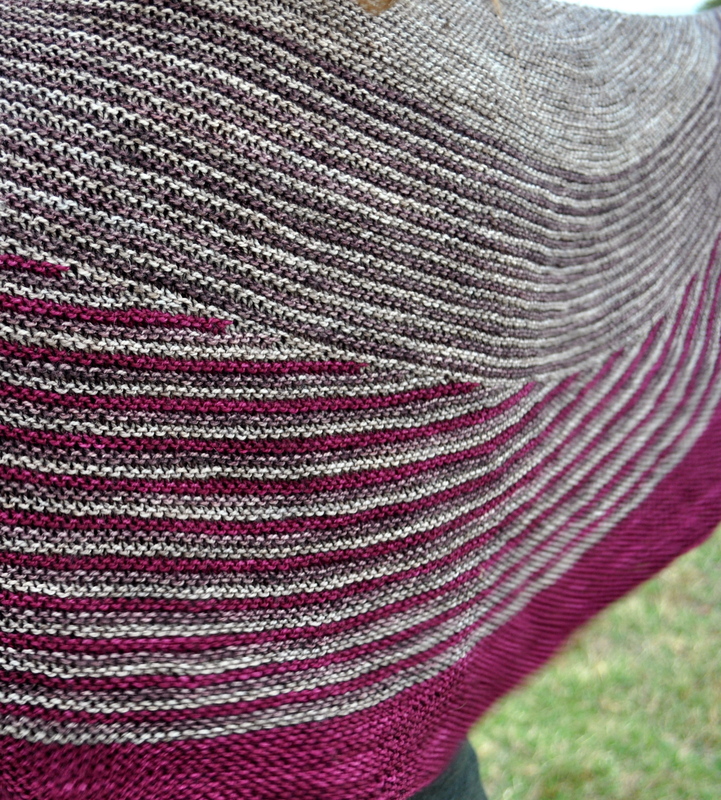 Of course it took a while for Sasha’s mom and I to choose our colors, and in the end I went with the same colorways as the sample we had seen (EFL and EZ) – probably because it was right in front of me and I knew it would be gorgeous! I’ll be honest, a lot of knitting goes into this project! 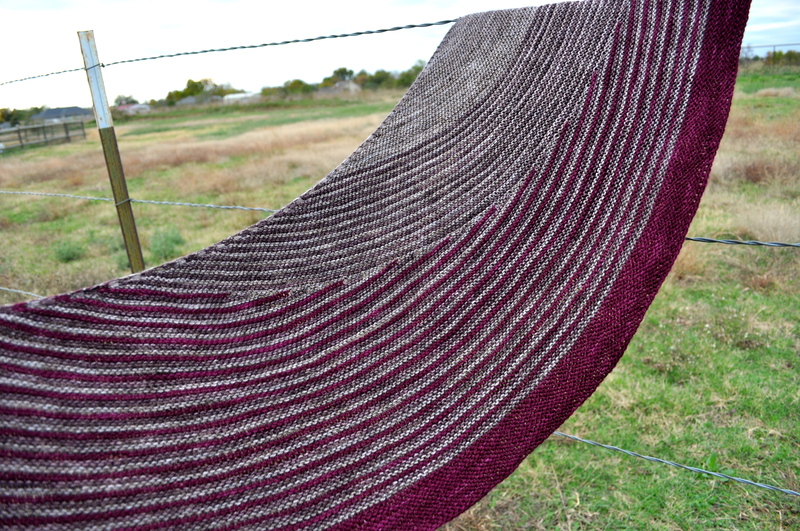 It’s a nice wide stole, so you are looking at some long rows, but the pattern repeat is easy to remember and the thought of the next color change keeps you going. Since it’s wool it’s super warm, and (possibly my favorite thing about Kauni), it smells wonderfully wooly! Great for wrapping up in the crisp fall weather! As for blocking the piece, I hope this isn’t a horrible sin against wool, but I decided to steam iron it! I spread the fabric out on top of a towel on my table and then placed a damp cloth over the fabric and ironed over the cloth. In the end I got a beautifully flat and regular piece of fabric which ended up nice and light with almost a drape-y quality. 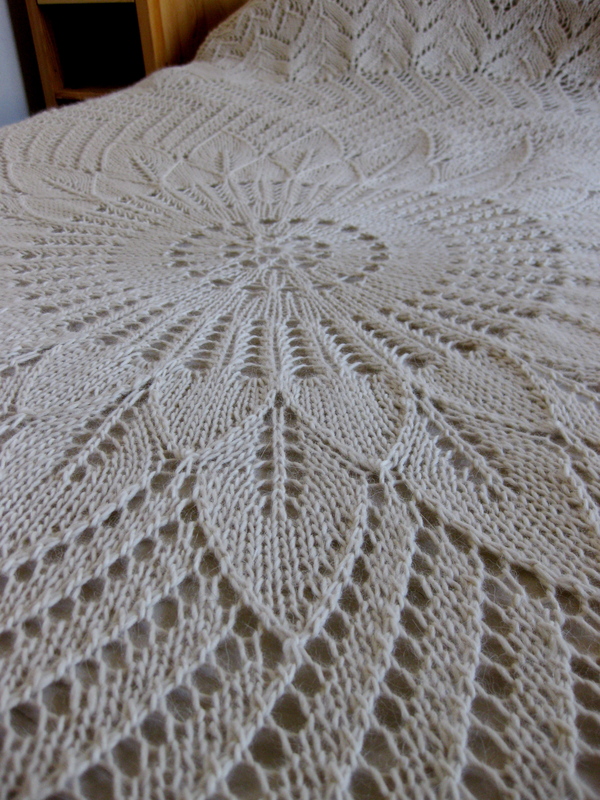 Seeing as Girasole is a giant circle, and I’m a little bit of a perfectionist when it comes to my knitting, I had to formulate a plan of attack for this monster. Here’s how it went . . . After soaking the blanket and getting rid of excess water by rolling it up in a towel, I placed the center of the circle in the middle of the office floor and stuck a few pins in to keep it there. I used a couple of pins through the hole in the end of my tape measure to secure it in place, then started pinning the points out – on my first try it soon became painfully obvious that to get Girasole to open up the way I wanted it to I was going to have to pin out the points 4.5′ from the center instead of 3.5′! Insert unintentional step of removing previously placed pins and starting over. Readjusting my tape measure to 4.5′, I began pinning out the points again, starting at 12 o’clock, then 6 o’clock, then 3 o’clock, then 9. After that, it was simply a matter of pinning out points halfway between previously placed pins, always placing one pin and then placing a corresponding pin on the opposite side of the circle. Admittedly, this means an unreasonable amount of walking around a nine foot circle, but the results are worth it! Take a look at the whole thing stretched out and taking up the whole floor . . .
Can you see my improvisation in the upper right corner? I ran out of straight pins with about fifteen points left to stretch out, so I, um, used wooden skewers from the kitchen. I’m not embarrassed – it totally worked! : ) And look what a beautiful edging it turned out to be . . .